You have Advance installed on your computer and the license activated (for example, Advance Professional 2011). You have acquired a higher Advance package (for example, Advance Premium 2011). The Advance Professional license was activated based on a Serial Number and Activation Code. The Serial Number is the unique identifier of the license (network or standalone). The Activation Code allows using the software version according to the purchased license features. A new Activation Code that authorizes you to use the features corresponding to the new acquired package. 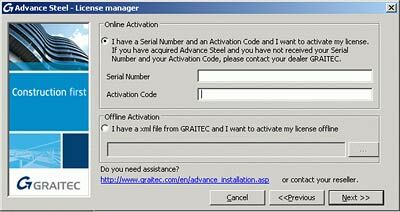 (For example, you have Advance Steel Professional 2011 and you received an Activation Code for Advance Steel Premium 2011). Since the Serial Number is unique, as long as an Advance license is active, you will not be able to activate the new package. 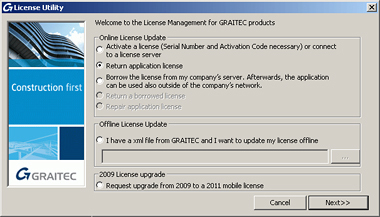 You must return the license to the GRAITEC License Server, and then activate the license for the new package using the Activation Code you received. 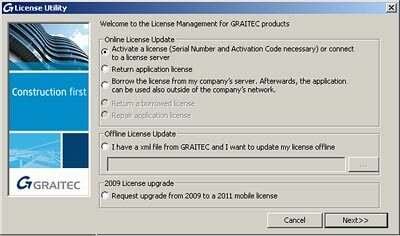 The license for the existing package must be returned to the GRAITEC License Server before activating the new license. (see Returning a license or see the Installation guide - p. 22). 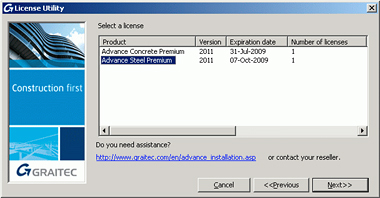 You can use Advance Premium 2011. 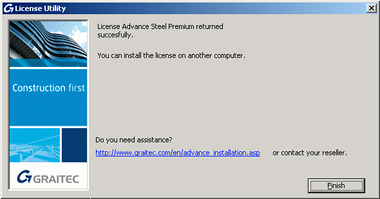 If you did not return the license for Advance Professional, you will see the following error message. The user purchased or received an Advance Professional license. The user activated the Professional license. The user received the new Premium license. Since the Advance Professional license is still active, the Quantity of available licenses is 0. The license is unique. If the user tries to activate the new license, an error message is displayed. The user returns the Professional license. The license is available and can be used based on the Activation code for Advance Premium. The user activates the Premium license. In the License Utility dialog box, select Return application license. Click Next. In the next dialog box, select the application for which to remove the license. Click Next. The next dialog box displays the confirmation message. Click Finish to complete the process. If your computer is not connected to the Internet, you can use the Offline procedure described in the Installation guide. In the License Utility dialog box, select Activate a license. Click Next. Your computer contacts the activation server at GRAITEC; the license rights are written in the database. The activation server receives the information and processes it. After clicking Finish in the last dialog box, Advance starts automatically.